We are a member of MYOB’s Global Developer Network and integrate with AccountRight Premier (now Classic) and Account Right Enterprise packages. Plus we now also work with MYOB AccountRight Live which is their Hosted version version. 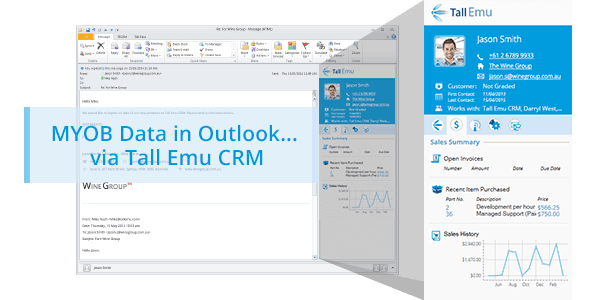 Why use Tall Emu CRM and MYOB together? Our MYOB Accounting Link lets you sync CRM with your MYOB, to allow customer, invoice, payment and other important accounts data to be shared. We can have your MYOB Data in your CRM in minutes…Request a Demo to see this action. Customers created inside CRM can be automatically created in MYOB, have an invoice created and copied to MYOB, then charge the credit card and post the payment details to MYOB too. MYOB Accounting Link plugs into Tall Emu CRM’s workflow module giving you extremely flexible control of how CRM interacts with MYOB. MYOB information can be used as the basis for campaigns or promotions. eg: a list of customers who’ve bought more than $200,000 worth of products from you in the last year, but nothing in the last month. Customer details and key financial information. Accounting Link allows the transfer contacts and key financial information such as sales summaries and account balances into the Tall Emu CRM system. You can also copy companies and contacts from Tall Emu CRM into your accounting system. 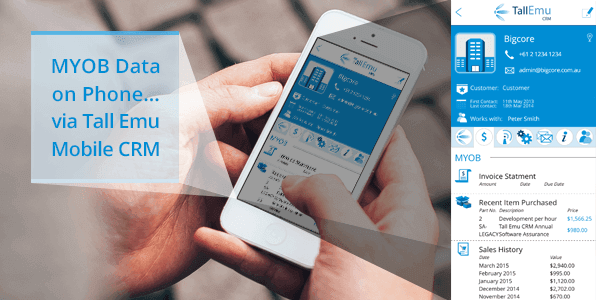 Once information is transferred into Tall Emu CRM, it becomes available to all users even if they normally they don’t have access to the accounting system. An example of this would be where members of the sales team using Tall Emu CRM can view customer account balances without requiring them to log into MYOB. If you and your team are using Outlook for your email using our new Inbox 360 outlook plugin you can now see your MYOB data directly in your MS Outlook. See the screenshot above to see how it looks. How to I install Tall Emu CRM Accounting Link? MYOB Accounting Link is included with every paid license copy of Tall Emu CRM. All you need to do is activate your MYOB Datafile to work with Tall Emu CRM (A free process) and you’re ready to go. Click below to see a video which shows you how to set up the MYOB interface, import your MYOB data into CRM and push data back from CRM into MYOB. It shows everything from installation of the CRM, right the way through to pulling in the data and reviewing. It’s quite long but does show you the entire process.